Palin already faces criticism for initial support for "bridge to nowhere"
Alaska Gov. Sarah Palin campaigns in Lee's Summit, Missouri, with Sen. John McCain Monday. In a 2001 statement opposing a transportation spending bill McCain singled out for criticism about $3 million worth of those projects. McCain's list of "objectionable" spending included a $2.5 million road project for the town that then had a population of 5,500, as well as a $450,000 appropriation for an agricultural processing plant there. "As mayor of Wasilla, Gov. Palin was forced to work within the current system to obtain critical funding for a growing city," the campaign said in a statement. By comparison, it said, Democratic presidential candidate Sen. Barack Obama "has consciously attempted to manipulate the system by requesting nearly $1 million every working day he has been in the Senate." Palin already has been facing questions about her stump-speech claim to have said " 'Thanks, but no thanks' for that bridge to nowhere up in Alaska." Palin originally supported construction of the infamous bridge from Ketchikan to its airport on sparsely populated Gravina Island, but canceled work on the span in 2007 after the price tag increased from about $200 million to nearly $400 million and it became a symbol of congressional excess. The governor hasn't faced reporters since August 29, when McCain tapped her as his running mate. But her lieutenant governor, Sean Parnell, said Palin has reversed her support for earmarked spending projects because "I think she saw what they were." "As you're in office longer, you see the cumulative effect from Wasilla to Pensacola, and you see the corruption that can come from those," Parnell said, referring to earmarks. Parnell is now locked in a still-unresolved GOP primary with "Bridge to Nowhere" advocate Don Young, the state's sole congressman for more than 30 years. Palin backed his challenge to Young in the Republican contest. But longtime Alaska journalist and former Palin staffer Larry Persily said the governor "is telling only half the story, as far as the earmarks." "She was hungry for funding from the federal government that could help her community," Persily said. Palin not only sought money from Alaska's congressional delegation, but she hired the former chief of staff to veteran Alaska Sen. Ted Stevens -- now under indictment in a wide-ranging corruption probe -- for help. The result was that Wasilla won $600,000 for a new bus facility, $1.75 million to upgrade its dispatch center and $2.4 million to improve water and sewer facilities. "We did well," Palin scrawled in the margins of a City Council memo on federal funds from 1999. Since becoming governor, she has cut the amount of money her vast, oil-rich state asks for from the federal government. But for the 2008 budget year, Alaska had more earmark requests per capita than any other state -- $500 for every resident. 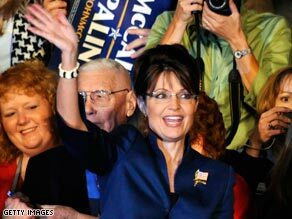 Palin sought about $450 million in earmarks during her first two years in state office, according to federal records. They include nearly $8 million to improve a remote airport in the Aleutian Islands, a former Navy airfield that handles eight scheduled flights a month; $4 million to research sea crab stocks; and $2 million to research rockfish.